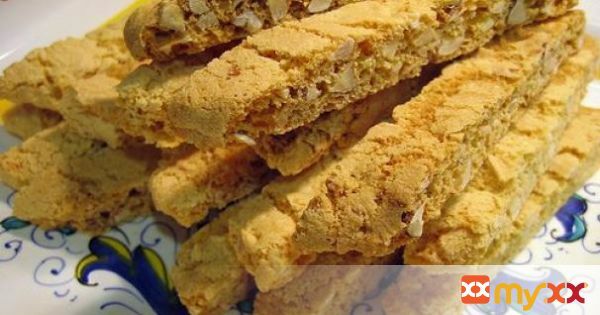 Years ago I lived in Siena, Italy and since then I've admittedly become a bit of a biscotti snob. The ones you find here in the States, I feel, are just too soft and cakey. My mom's are the only ones I've found that remind me of the teeth-cracking ones in Italy.The key to achieving a true biscotto's must-have hardness is acquired in the second baking, hence the name biscotto (biscotti is the plural form), which means twice baked in Italian. If you wish them to be less hard, reduce the second bake time. But, if you like to dip yours in cappuccino or a nice vin santo as they do in Tuscany, then you want them hard.Variations: 1 t. orange extract, zest of 1 orange with 1-½ c. pistachio nuts. Can also use pine nuts in place of almonds. 3. Sift together flour, sugar, baking powder, baking soda, and salt. 4. Add 2 whole eggs and 1 egg yolk, almond extract, and almonds. 5. Mix thoroughly until dough holds together. 6. Add half of reserved egg white, if necessary, to make a cohesive dough. 7. With wet hands, shape dough into 4 logs, each 6” long and 1 ¾“ in diameter. 8. Place 3-4” apart on baking sheets. 9. Bake on middle rack of oven until logs are light golden brown and spring back when touched (about 24 minutes). 11. Lower oven to 275. 12. Slice logs with a serrated knife diagonally into 1/2” slices. 13. Return to oven and bake until completely dry and crisp throughout (about 40 minutes).